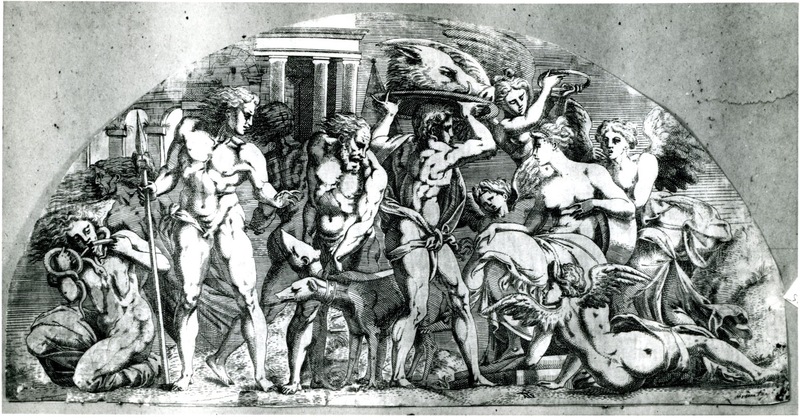 Etching by Antonio Fantuzzi, 24.7 x 48.7 S, half circle (London). Inscribed with Fantuzzi’s monogram at bottom toward the right. Bartsch, XVI, 1818, 345, 20, as Fantuzzi after Primaticcio. Herbet, II, 1896, 264 (1969, 60), 55, as after Primaticcio, but noting that it has been attributed to Rosso. Zerner, 1969, A.F.75 (Paris), as 1544-1545, the inventor of the composition seeming to be Rosso, whose style has been transformed by Fantuzzi in a Primaticcio-like manner. COLLECTIONS: London, 1851-2-8-99 IMP.SIZE. New York, 49.97.566, cut at the sides. Oxford, Ashmolean (damaged). Paris, Ba 12, fol. Paris, Bibliothèque de l’Arsenal, Vol. 168(1), no. 12 (see Schéfer below). Vienna, Vol. XIII, I, p.57, no. 117. Schéfer, 1894-1929, col. 552, no. 12, after Primaticcio? Dimier, 1900, 462, as after Rosso. Zerner, 1964, 75, as 1544-1545. Béguin, RdA, 1969, 105, stated that there are several drawings of this subject, one in the Städelisches Kunstinstitut, Frankfurt, and that the composition is probably by Rosso. Zerner, in EdF, 1972, 273, no. 326, as perhaps after Rosso. Zerner, IB, 33, 1979, 240 (Paris). K. Wilson-Chevalier, in Fontainebleau, 1985, 71, Fig. 25 (Paris), 72-73, no. 25, as after Rosso. The etching is related to, but in reverse of, the drawing in Frankfurt mentioned by Béguin, a drawing that is a copy of a lost original that Fantuzzi may have worked from, unless he worked from this copy, which bears the marks of a stylus. As discussed in the Catalogue of Rejected Drawings (RD.16), this drawing (Fig.RD.16), in spite of its Rossoesque qualities, is most probably a copy of a lost drawing of the early 1540s by Primaticcio. A small area of the composition around the top of the print would seem to have been added by the etcher.